I often get my photos shared from Instagram accounts like REI, Mountain Hardwear, Evo, and so forth. One of my goals for putting out content is to really inspire people to get and explore our beautiful world, so I’m always happy when they share it. 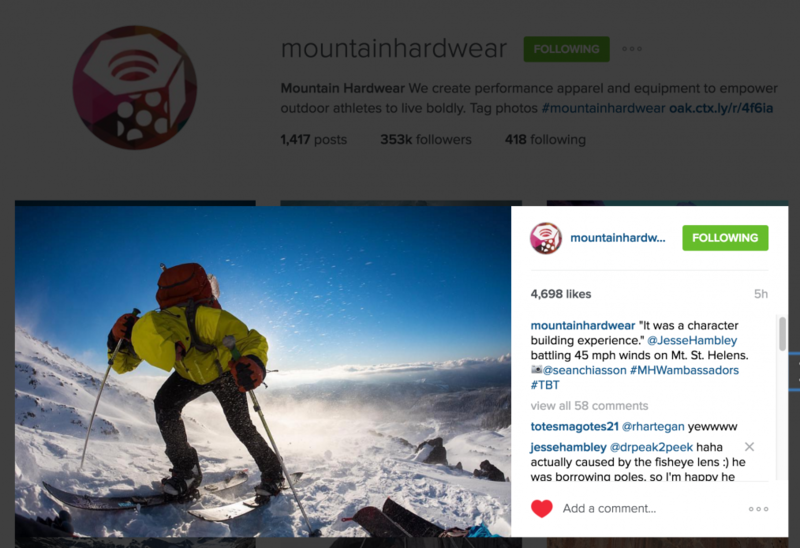 Today Mountain Hardwear shared one of my photos of a friend getting wind-blasted on Mt. St. Helens at the beginning of the year. I threw together a quick edit, just to show what went in to making the photo. I think we are often always faced with the question when we are having type 2 fun… Should we pull out the camera or not… I think the correct answer is ALWAYS. On this trip, my friend Eric Han was in town for the holidays and I promised to take him up a mountain. As the weather forecasts revised the night before, we saw that the winds were going to get a little intense. Given it was going to be a perfectly blue bird day, we decided to go for it anyways and my friend Sean Chiasson agreed to jump on board too. After a pretty eventless few hours getting above tree line, we faced the wrath of our decision. Hunkered down as the wind kept picking up a 2″ rain crust and assaulting us with it, I snapped the photo that Mountain Hardwear shared. This footage is a quick edit of the trip, please take notice to the safety we took on the ride out. The strong winds were starting to form a 5″ cross-load wind layer, so we carefully leap frogged each other down and kept our terrain choice very mellow.